When we first rode the NTorq this year, we were simply blown away by what a great package this small scooter offers. The overall build quality, sporty design, ride and handling, peppy and smooth engine, brakes, incredible features, and, of course, its aggressive price point make the NTorq a perfect package. TVS took its own sweet time to launch a 125cc scooter, but when they did decide to join the party, they made sure to launch only the best. And that’s exactly what the NTorq is – the best 125cc scooter you can get your hands on today. The NTorq also comes loaded with some segment-first features. 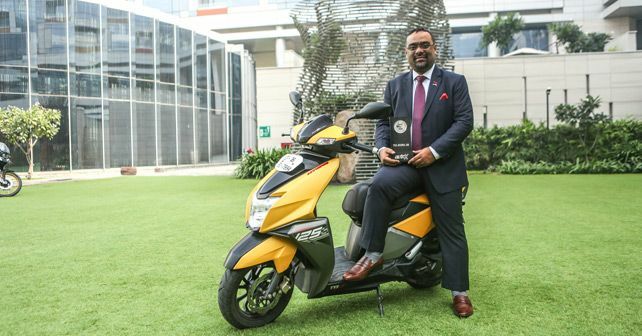 It’s India’s first connected scooter, as it comes with Bluetooth connectivity or SmartXonnect feature. The engine is simply a blast – it’s smooth, with a crisp throttle response. However, the main highlight of the NTorq is its ride and handling balance. It comes with a telescopic front fork and gas-filled, hydraulic-type, coil-spring shock at the rear. And, from what we can tell, the suspension’s been tuned to perfection. The NTorq is certainly worthy of ‘Best of 2018’ honours.